Europa Park's Wodan Timburcoaster: Wow. TMNT Shell Shock, Turtle Power! 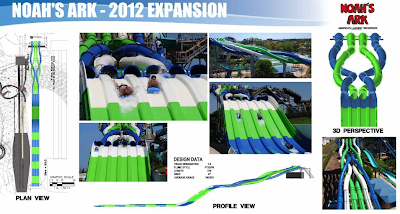 Noah's Ark water park, located in the Wisconsin Dells, has been sold and is now a part of the Palace Entertainment family. Billed as "America's Largest Waterpark," Noah's Ark has an extensive collection of water rides along with a few amusement park style rides on its property. The park covers 70 acres, has a total of 51 water attractions and two hotels as part of the complex. Palace Entertainment operates over 40 amusement and water parks and family entertainment centers in America, including Kennywood and Lake Compounce. It is a part of Parques Reunidos, which owns 50 parks in twelve different countries. 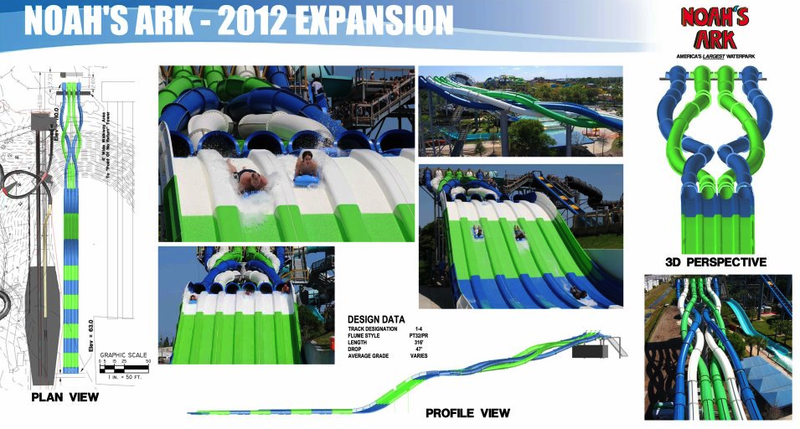 Noah's Ark had previously announced the addition of the Quadzilla, a four lane mat racing slide, seen above, as a new for 2012 addition. The park was formerly privately owned and operated by the Gantz family, and has been open for more than 30 years.